Comparethemarket.com is one of the UK’s leading providers of price comparison services, and also one of the country’s most well-known household brands because of its meerkat marketing campaigns. But its popularity didn’t come from clever marketing alone. To reduce friction during development and achieve the performance needed for the most demanding workloads, comparethemarket.com is using MongoDB as the operational backend for an increasing number of microservices across the company. MongoDB replaced Microsoft SQL Server, which proved difficult to scale as the company’s services became popular and traffic skyrocketed. Comparethemarket.com currently runs a hybrid environment with some of its older services running on-premises, while newer microservices are deployed in Amazon Web Services (AWS). However, plans are already in place to move everything to the cloud. Each microservice uses its own MongoDB database, with Apache Kafka used between services to maintain synchronization. Orchestration and continuous delivery is made easier using Docker. Finally, the data is pulled into Hadoop to be aggregated and processed with historical data to build enriched “data products.” Comparethemarket.com is also evaluating Spark and using AWS Lambda functions to further automate data processing. By moving to a microservices architecture built on MongoDB and AWS, comparethemarket.com was able to cut their project timelines in half and ensure service uptime by distributing their MongoDB deployments across Availability Zones. 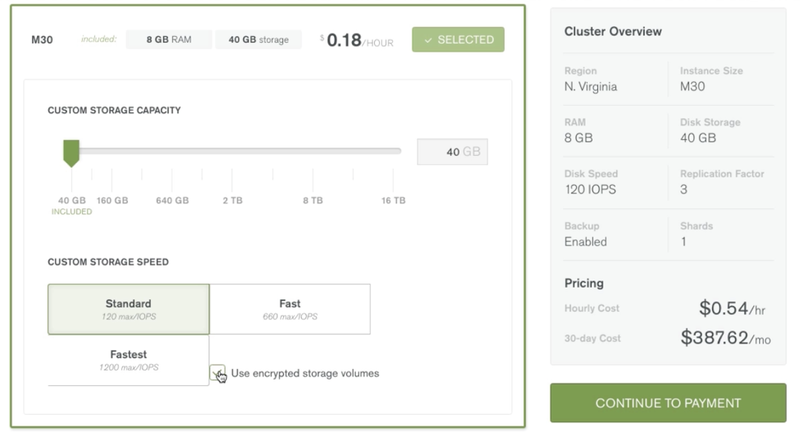 MongoDB Atlas is a new hosted database as a service for MongoDB that makes it easier than ever to set up, operate, and scale your MongoDB deployments in the cloud. The offering recently debuted on AWS and is offered on demand. With MongoDB Atlas, users get the benefits of a flexible, highly available, and elastically scalable database without having to worry about the operational overhead of managing their clusters. MongoDB best practices are built in and automated, data is highly secure by default, and otherwise complex operations are reduced to just a few clicks in the MongoDB Atlas UI.